Whether you’re driving on west coast freeways, in the middle of the country, or traveling on the roads back east, the weather can be unpredictable. Call it unpredictable weather and unforeseen conditions, it can be ninety degrees in Atlanta in the month of February and record-breaking rain in Northern California at the same time. Driving a rig becomes increasingly challenging when handling a trailer and load in extreme temperatures. Some of the tips for managing the roads that are given in this article may seem to be just common sense, but you might be surprised to learn that some operators tend to overlook basic safety steps.To assure you are not one of needless casualties of poor weather conditions, take a closer look at how to remain safe when driving in variable and changing street conditions. Whether the roads are slick from excessive heat or slippery from frozen ice, the majority of accidents are due to excessive speed. Adjust your speed to safely match weather and road conditions, visibility, and traffic. The Fatality Analysis Reporting System (FARS) recently reported that 25 percent of speeding-related large truck fatalities occurred during adverse weather conditions. 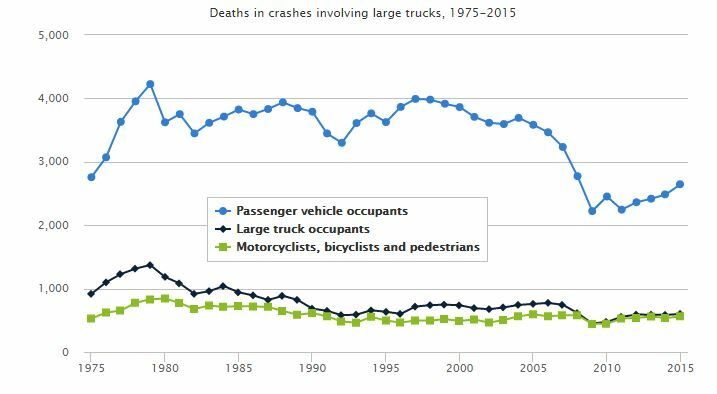 Truck driving jobs require on-time delivery, but nothing is worth a devastating crash. Driving at the speed limit may be legal, but in poor weather, it is often too fast. The first rain on a road can be among the most dangerous. When it begins starts to rain, water mixes with oil on the road making it especially slippery. As an experienced driver, you know that fully loaded trailers require 20 to 40 percent more braking distance than passenger vehicles to come to a complete stop.When the rain, snow or summer glare is intense, visibility is low, so it is necessary to leave plenty of room between your vehicle and the vehicle in front of your truck. When the weather turns nasty, it may be tempting to pull over to the shoulder of the highway and wait it out.This action can become deadly for both you and others. For example, other vehicles can mistake your position for actually being on the road and as a result, may slam into the back of your rig. It is smart to take a break if conditions are not safe to drive in or if visibility is hampered.If you have a sleeper, pull into a safe, well-lit rest area, truck stop or parking lot.Recognize that it’s very dangerous to be out on the road in severe weather and don’t let dispatchers and extra pressure influence your decision-making and put you in a dangerous position. Don’t feel that you’re letting anyone down by not meeting an unrealistic schedule. A study referred to as The Large Truck Crash Causation Study (LTCCS) found that “5 percent of truck crashes occurred when the Commercial Motor Vehicle (CMV) driver was following …too closely.” Therefore, it is critical that proper “following distance” be adhered to so that there is enough stopping time to prevent collisions. Those who have never driven a full trailer often have misconceptions about skilled drivers who accept the challenge of trucking jobs.Traditional automobile drivers may have the mistaken belief that semi-trucks operate the same way an automobile operates in terms of braking - nothing could be further from the truth. In general, the average stopping distance for a loaded tractor-trailer traveling at 55 mph (in ideal conditions) is 196 feet, compared with 133 feet for a passenger vehicle, according to the Federal Motor Carrier Safety Administration. But both types of transportation are affected by environmental elements such as rain and snow. The Jake Brake can be a valuable tool in stopping a packed truck. It is primarily used for slowing down a big rig, in certain situations.However, the Jake Brake is not designed for use on ice. 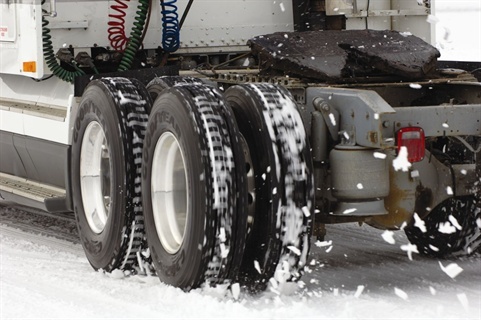 In very slippery conditions it can cause the trailer to fishtail (a situation that occurs rear wheels lose traction, resulting in over steering and the swaying of the trailer being towed). The Jake Brake is also prohibited in some areas. Diesel engines are designed a compression release brake, also commonly referred to as a “Jake Brake,” that opens the exhaust valves, creating a piercing sound. For many drivers it is an effective braking method, creating massive amounts of force. This can extend the life of friction brakes. 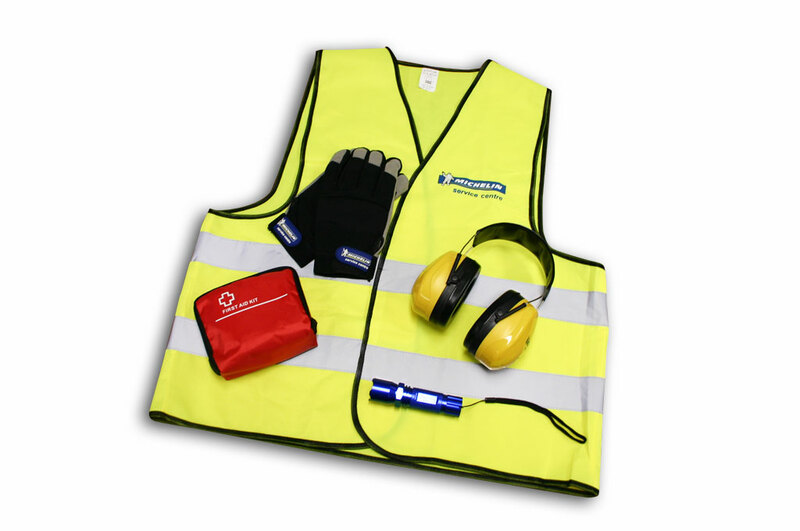 It assists drivers in maintaining better control of their rig such as when driving down a steep or long slope. However, it is important to be cognizant that engine braking is prohibited in some areas because of the loud noise it creates. Remember, the weight and speed, along with other variables such as the climate and elevation all affect braking time and efficiency. You never know when the weather will take a turn for the worst. It is imperative to ensure your truck has plenty of fuel, so keep the tanks topped up. There is no joy in running out of diesel on a lonely road when the elements are bad. Full fuel tanks also provide extra weight over the drive tires which is beneficial for traction. Before you jump inside and get on the road, always check your tires. 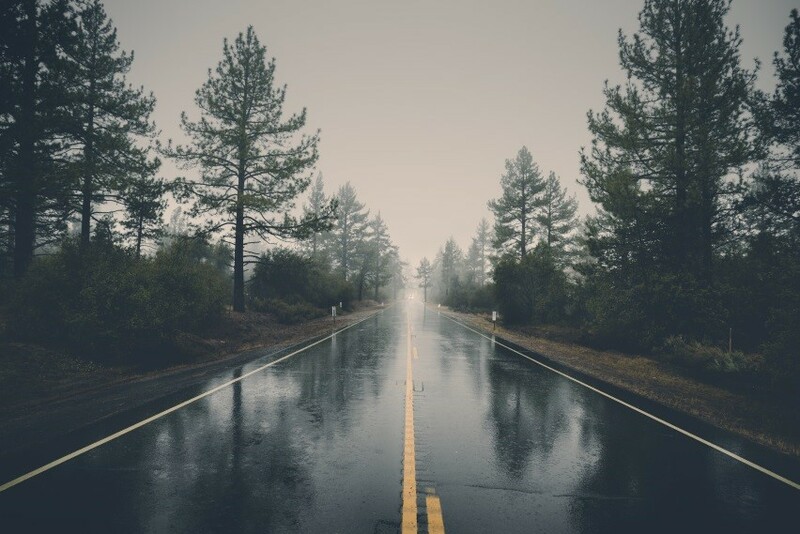 Wet conditions such as rain and snow can all have a negative impact on how everything from the wheels to the tires.For example, in soggy situations, there is much less stability and friction between the wheels and the road. Examining your tires for wear and tear, along with checking tire pressure and alignment, are essential to ensuring your vehicle’s safety on the road. This will also improve gas mileage and performance. Worn tires or improperly fitted trailer hitches are a major hazard on the highway. Your tires can be a driver's best friend in the sense of good traction for safe winter (and summer) driving. Lights and reflectors are a vital when driving, especially in deteriorating conditions when it is hard to see the road and the other cars and trucks. Hail, snow, and other dangerous weather conditions can easily build up on your truck’s head and tail lights, so make stops to keep them clean and clear. The newest models of trucks are equipped with LED lights. LED lights are a great innovation, but they do not generate the same amount of heat that incandescent bulbs did. This means you have to check your LED lights more frequently to ensure they are obscured by snow, dirt or debris. - Portable power charger for your Smartphone. Some commercial truck drivers have the luxury of going down the same routes on a regular run. However, the majority are traveling on a variety of roads and experience unique challenges when it comes to navigation. If you are using your Smartphone for GPS, we all know there is an app for just about everything. Just remember you’ll be viewing it all on a 3.5” screen.There are other options such as a small laptop running GPS software with road restrictions as well as truck-specific GPS units. The most important aspect of navigation equipment is that they allow you to keep your eyes on the road at all times. Safety first. Sometimes the most serious conditions are ones you cannot see. Wind gusts affect truck drivers and make it much more difficult to control the rig. High winds can also stir up dust and debris, impeding vision. Under serious weather conditions, it is not easy to drive. Regardless how many years’ experience you have on a big rig, never underestimate bad environment conditions. You are not alone on the roadways. The unpredictable actions of other motorist are a danger all in themselves. Truck driver jobs come with an enormous amount of responsibility.This duty to yourself and others on the road is multiplied when driving in extreme heat or cold, snow or ice, wind or rain since requires greater concentration, focus, and awareness. Be prepared and know your limits whenever you get behind the wheel and especially in unpredictable weather.